Born in Beverly, MA, she played lacrosse, basketball, and field hockey at the Garrison Forest School in Garrison, MD, and was a lacrosse player at Boston University. After college, while working in interior design and home renovation businesses, she concentrated on tennis. “My sister got me into running when she asked me to run the last ten miles of the Boston Marathon with her. After that experience, I jumped right into the running world and ran my first race, the NYC Marathon, the following fall.” She then competed successfully in numerous local road races. During pregnancy and when at home raising her children, the stationary bike became a temporary fitness program. Her mother is one of nine children, who were all competitive athletes throughout their college years. “When an uncle went to Bermuda to compete in a triathlon, he suggested I try one. It sounded like fun, so I trained for it and won the whole amateur division.” She eventually won the national championship in her division and turned pro in 1995. When in training for triathlon competitions, DiPietro has already put in an early morning swim before heading home to send her sons off to school. Soon after she is out for an hour run, working with clients in her fitness business, or the Triathlon Academy. Then it is off for another hour run before spending the evening with her family. On the weekends, she occasionally will include a three-and one-half hour run at 7:30 pace. Her training no longer includes a weight program, but usually three-hundred sit-ups per day. 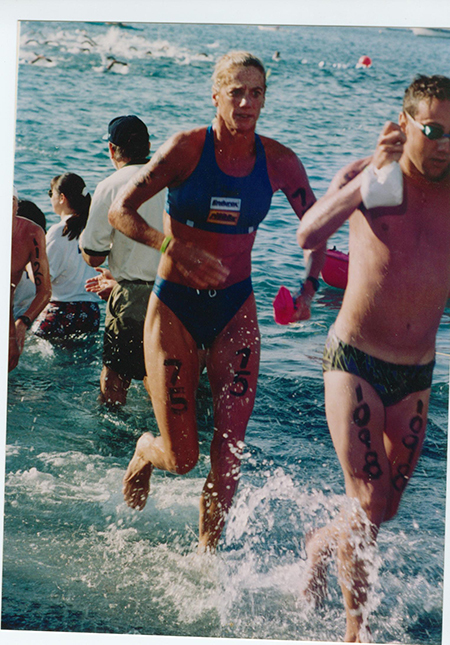 In 1997, she placed sixth overall with the second fastest marathon (3:09:31) at the Hawaii Ironman World Championships. The event also includes a 2.4 mile swim and a 112 mile bike ride. In 1996, she placed eleventh and in 1998 fifteenth. DiPietro qualified for the 2000 Olympic Marathon Trials with a 2:47:11 at the 1999 Chicago Marathon, placing second in the masters category and 33rd overall in the women’s division. Last year also included a female masters course record at the Hampton- POMOCO Half-Marathon with 1:19:40. She also ran 17:12 at the Ferndale-Linthicum 5K and 35:44 at the Beach to Beacon 10K.